Cahall’s Deli is an award-winning butcher shop where you can select your cut of meat to enjoy at home. We also carry a selection of our favorite products and brands! 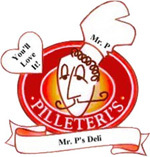 Pilleteri`s Original Seasoning is a special blend of fine spices and ingredients. Original blend is mild. Kids love it on burgers, steaks, and chicken. Our most popular blend for all ages. Pilleteri`s is a concentrated powder. Refrigerate after opening. No MSG. Cahall's dressings, which are more than just a dressing, have been bottled for Cahall's for over 28 years. Looking for a great dressing/marinade to pour over chicken or fish and bake, then you must try Cahall's Lemon Peppercorn, Vidalli Onion Peppercorn or Vidalli Onion Summer Tomato ideal. And of course any of our large selection of dressings is ideal for your summer greens, lettuce and cucumbers come in today and try one. 2019 © Cahall's Deli. All rights reserved.